The new Ram 1500 Laramie is an impressive truck that’s now poised to sell more and appeal to a larger audience. Here's how the Ram seems to move ahead of the competition. If you look at sales of vehicles in the U.S. you might be surprised to know that the top three are pickups. Ford, Chevy and Ram full-size pickups are selling well ahead of the rest of the pack which means big business and profits for the “Big Three” U.S. automakers. Ram has been number three but the race for second place or better is heating up as the Ram 1500 has been named 2019 Truck of the Year by Motor Trend and North American Truck of the Year by the North American International Auto Show in Detroit. The redesigned Ram is serious about gaining market share. 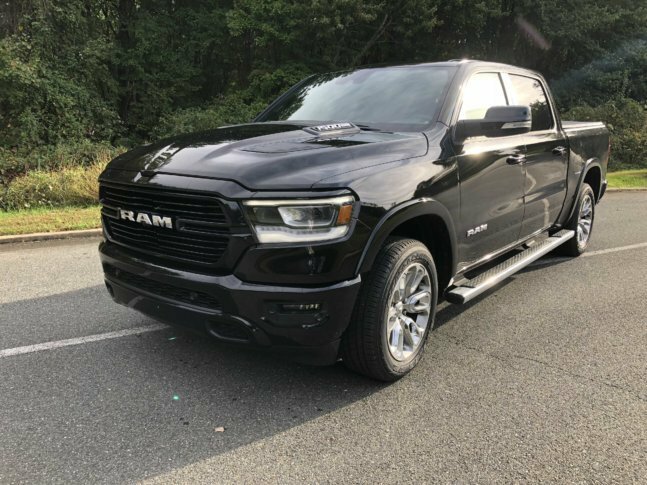 The new 2019 Ram 1500 Laramie crew cab is not the most luxurious trim level the Ram 1500 line offers, but it seems top quality — and it should be for nearly $63,000! The heated and ventilated leather seats are comfortable, and the seat heat works well and heats up quickly. Backseat riders also have heated seats. There is good space for adults, fitting three adults with no problem. But where the Ram seems to move ahead of the competition is the rest of the interior with improved materials used throughout. Touches like the contrasting stitching color of the seats, door panels and the soft touch dash add a classy, upscale look. Storage space for smaller items is plentiful in the new Ram. There is a large center console and door pockets and lockable spaces under the rear floor. My truck came with a host of options like the large panoramic roof that lets in a lot of light and air. A $4,595 Level 2 option package adds a larger 8.4-inch Uconnect, touch screen with NAV and a 19-speaker Harman Kardon sound system with HD radio and wireless charger for your phone. Behind the wheel, the new Ram 1500 crew cab is improved. For a large vehicle it drives a bit smaller than it is. The ride is smoother than other trucks in this class, even with an empty bed you don’t get that odd feeling over bumps. It handles well for a truck but once you push it in corners you quickly realize this is a big, heavy machine that doesn’t want to be pushed. The highway is where this quiet cruiser shines as the cabin is hushed and serene. One thing that takes some getting used to is the rotary knob for the transmission on the dash. More than once I reached for a nonexistent column shifter (old habits die hard). My tester also came with optional $2,545 eTorque Hemi V8 which adds a mild hybrid for improved fuel economy. I’m not sure how much MPG it saved as I managed about 16.7 mpg for my week and 487 miles, which is under the 19 mpg the sticker touts. The Hemi V8 sounds good under acceleration but didn’t seem as fast as the Ford or GMC trucks I drove recently. There is an upgrade in the Ram technology with adaptive cruise, brake assist, lane departure warning and forward collision warning. Plus, it will park for you; just follow the directions, work the transmission and it does the rest. This year, Ram trucks look different than before. It seemed that the Ram had almost the same look for a decade or so. But 2019 models have a smoother look with more rounded corners and softer lines. You know it’s a Ram, but one that looks like a more expensive, upscale, modern version. This Ram came with the Sport Appearance Package which adds a raised hood that looks cool and gives off a sporty impression. The blacked-out grill and trim pieces look sharp with the Diamond Black Crystal exterior paint color. The large, bright 20-inch wheels are a good contrast with the paint color. The wheel-to-wheel side steps make hopping in easy. The longer steps make putting things in the bed much easier. The rear bed had the optional LED bed lighting and four adjustable tie-down hooks. The tri-fold tonneau cover keeps items in the bed and covered. Getting in the bed isn’t as easy as some others and space is average for the class but smaller than the new GM bed. The new Ram 1500 is an impressive truck that’s now poised to sell more and appeal to a larger audience. With so much at stake, the new Ram jumps ahead by providing luxury and technology in a polished package.